Has the time come to recognize all the sins and help knowing the painful truth at the end? Is it also the moment to forgive and turn the page? Russians and Poles commemorate the massacre of Katyn together for the first time. It’s probably the needed symbolic act to start new relationships. Willy Brandt, Chancellor of the Federal Republic of Germany, knelt before the Warsaw Ghetto Memorial in December 1970. In 1984 the French president François Mitterrand and the German Helmut Kohl stood hand-in-hand as they paid tribute to the soldiers from the two countries who died in combat during the First World War. For seventy years, Katyn tragedy has provided Soviet and Russian governments with a political and diplomatic headache. It is the heart of the dispute between Moscow and Warsaw that has even undermined EU-Russian relationships with unthinkable consequences in the recent past, after May 2004. Until the late 1980s, the official version was that German troops had killed about 22,000 Poles in 1941, in the wake of the German attack on the Soviet Union. 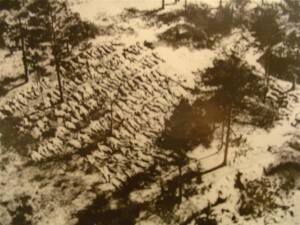 But the Germans uncovered the mass graves at Katyn in 1943 and shifted the blame towards the Soviets. The truth emerged almost half a century later. The then Russian president Boris Yeltsin opened the archives in 1992 and released documents carrying the signature of the Soviet dictator Joseph Stalin. It was the first piece of irrefutable proof that Soviet death squads, not German soldiers, were the perpetrators. “I did it right away,” said Yeltsin. “Every secretary-general of the Communist Party handed these documents to his successor, who put them in his personal safe and kept silent.” Yeltsin offered his apologies to Poland, according to witnesses, with tears in his eyes. Now Poland demands the opening of archives related to an investigation, carried out between 1990 and 2004, of the massacre, as well as an official rehabilitation of the victims. Arguments between Russia and the West about who was responsible with Adolf Hitler for the start of World War II cast a shadow over last year’s 70th anniversary commemorations in Gdansk and still irk relations. The Kremlin has resisted attempts to challenge the Soviet role in World War II, in which 27 million Soviet citizens died, according to official figures. Prime Minister Putin underlined that he is aware of how important the issue is for Poles when he invited his colleague Donald Tusk. Katyn massacre is only a drop in the ocean of blood caused by Stalinism. According to the latest research, other 100,000 Poles living in the Soviet territory died in gulags. But millions of people, above all Russian citizens, lost their lives in the 1930s and in the 1940s. These elements give some explanation of Moscow’s attitude towards its history. In the current attempt of reconciliation the two Slavic countries requested the Catholic and Orthodox Churches for help. It was the same solution used in 1965, when Polish bishops wrote an historic letter to German hierarchs furthering the process of pacification between both nations. It is also important that the Federal channel “Kultura” transmitted the documentary film “Katyn” by the Polish director Andrzej Wajda. For the first time since the invention of television Russian audience could see their people not behaving as heroes or becoming victims of the evil but acting as criminals. Last Friday’s show must not be forgotten when experts will discuss about censorship. See also Danzica – 70 anni dopo, EuropaRussia. Andrzej Wajda. Katyn. The defeat of the silence, EuropaRussia. 1 Response to Katyn. The end of a shame?